Colby completed an extensive research project on the history of religious and spiritual life at Lawrence and designed a display to share this history for the dedication of Sabin House. The display is still on view in the group room on the second floor of the house. Emma digitized a number of written transcripts of Commencement addresses, dating from 1926 to 1974. 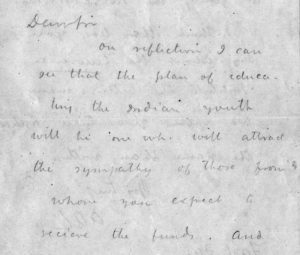 Colby transcribed a series of letters written by Henry Colman (class of 1857) and his brother Elihu Colman (class of 1865) to their parents. These letters provide a unique view into student life during Lawrence’s early years. This is not to mention a bunch of other tasks that are not as exciting to read about but equally important for Archives operations (advanced paperclip removal, data entry, CD processing, and so on.) Thanks to both Emma and Colby for all of their work! 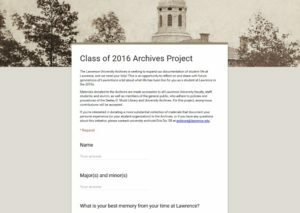 Calling all seniors: the LU Archives is seeking to expand our documentation of student life at Lawrence, and we need your help! This is an opportunity to reflect on and share with future generations of Lawrentians a bit about what life has been like for you as a student at Lawrence in the 2010s. If you are interested in sharing reflections, please consider submitting a response to this form. Responses will be added to the Class of 2017 collection in the LU Archives and made accessible to all users who adhere to policies and procedures of the Seeley G. Mudd Library and LU Archives. For this project, anonymous responses will be accepted. 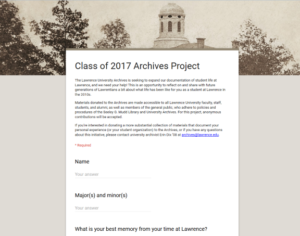 If you have questions about this initiative or are interested in donating other types of materials that document your time at Lawrence, please feel free to email archives@lawrence.edu or stop by the Archives in the library (level B). Enrollment dropped quickly after war was declared as men students began enlisting, serving with the YMCA, or joining other organizations in support of the war. This decline continued throughout the 1917-1918 academic year. Students who remained at Lawrence (and particularly women students) led efforts to support the war, forming a Red Cross chapter, making bandages, sponsoring drives to sell war bonds, and so on. Anti-German sentiment resulted in a 50 percent drop in attendance for German language courses by the fall of 1917. By the next fall, only seven students chose to enroll in German classes. More ominously, German faculty members faced discrimination both on and off campus. Lawrence would likely have closed had it not joined 300-400 colleges around the country in hosting a Student Army Training Corps (S.A.T.C.) unit in the fall of 1918. 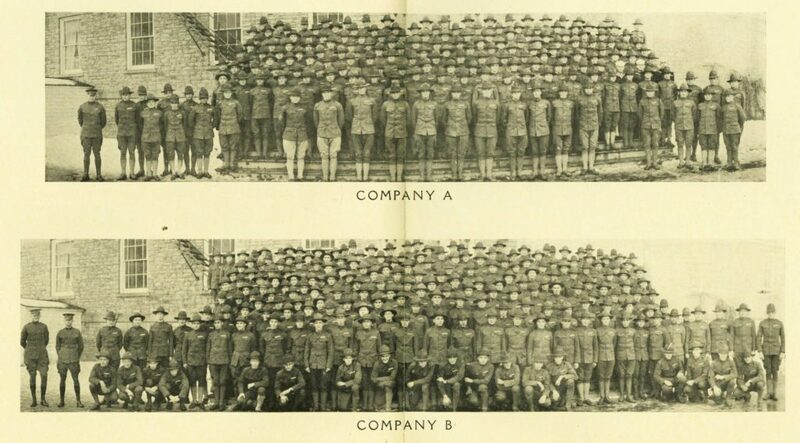 Four hundred men joined the unit and attended Lawrence, along with 210 women and only 36 civilian men. The signing of the Armistice in November 1918 led to the discharging of the unit in December, but operations at Lawrence had radically changed for these few months. When all was said and done, twelve Lawrence students and alumni were killed in the war. The Memorial Chapel was dedicated in part to their memory when it was completed in December 1918. The war also brought about changes at Milwaukee-Downer College. Most notably, it provided the impetus for expanding the school’s “Applied Arts” curriculum into an Occupational Therapy program, one of the first in the country. The next year and a half will provide opportunities to explore some of these changes in depth. In the meantime, if you’re interested in researching this period in Lawrence history, we have lots of resources in the LU Archives. 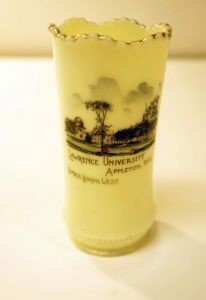 Lawrentians have been coping with Wisconsin winters since classes began in 1849. The Archives has accounts of students having sleigh-rides and making maple candy in the 1850s. In 1928, the athletics department organized a “winter sports carnival” – this featured inter-class competitions in skating, skiing, and tobogganing and was held for just a couple of years. Sometime in the 1940s, a “winter weekend” ski trip to Sturgeon Bay became a mostly annual tradition, lasting into the 1970s. (After our calendar switched from semesters to trimesters in 1962, the phrase “winter weekend” also referred in general to the mid-term break period in February.) 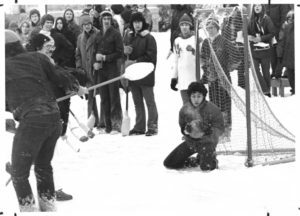 On-campus snow sculpture contests also became traditional starting in the 1940s. But today’s action-packed “Winter Carnival” is directly modeled on one that started in 1976. (There’s an article about it on page 8 of the January 23, 1976 Lawrentian.) This event was held annually until 1979 (then once more in 1981 as “winter menagerie” for some reason.) Student Affairs staff members revived this incarnation of Winter Carnival in 2011 and it has been held every year since then. 2011 was also the first year of the President’s Ball, so this year’s ball will be the 7th annual. 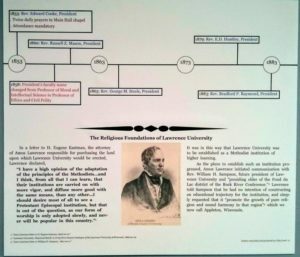 Some of the confusion in recent years about this history likely stems from a blurb in Lawrence’s sesquicentennial publication, “Time and Traditions,” published in brochure format and as a cutting-edge website in 1997. It cites 1933 as the year that “Students painstakingly stack blocks of ice to build a chapel. Ice sculptures become part of Winter Carnival, a tradition that is revived off and on until the present day.” There were ice chapels built on the campus in 1932 and 1933, but these were designed and built by local architects and builders, not students. And there was nothing called “winter carnival” in 1933. So to sum up: technically, this year would only be the “7th annual” Winter Carnival. But many of its components have roots in older traditions at Lawrence, and that is worth celebrating. Wednesday, October 26th, 8-9pm: Join us in the Milwaukee-Downer Room (a.k.a. the “Harry Potter Room”) of the Mudd Library for tales of Haunted Lawrence. Attendees will hear true stories of ghostly happenings on campus (past and present), have the opportunity to share their own stories, and view some spooky materials from the Archives. There might even be treats! Lawrence was founded to provide “gratuitous advantage to both sexes of Germans and Indians.” Often mistakenly attributed to Amos Adams Lawrence, this quote actually comes from a fund-raising brochure written by Reeder Smith (an agent hired by Lawrence to raise money for the school) in 1847. The brochure was circulated among potential donors, so it was written to appeal to their charitable impulses. 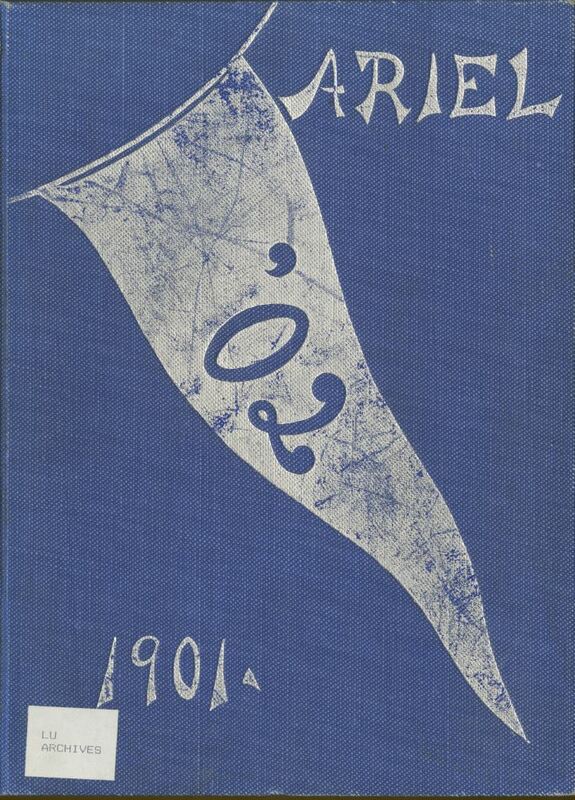 You can read the full brochure starting on page 30 of the 1922 Lawrence College Alumni Record. 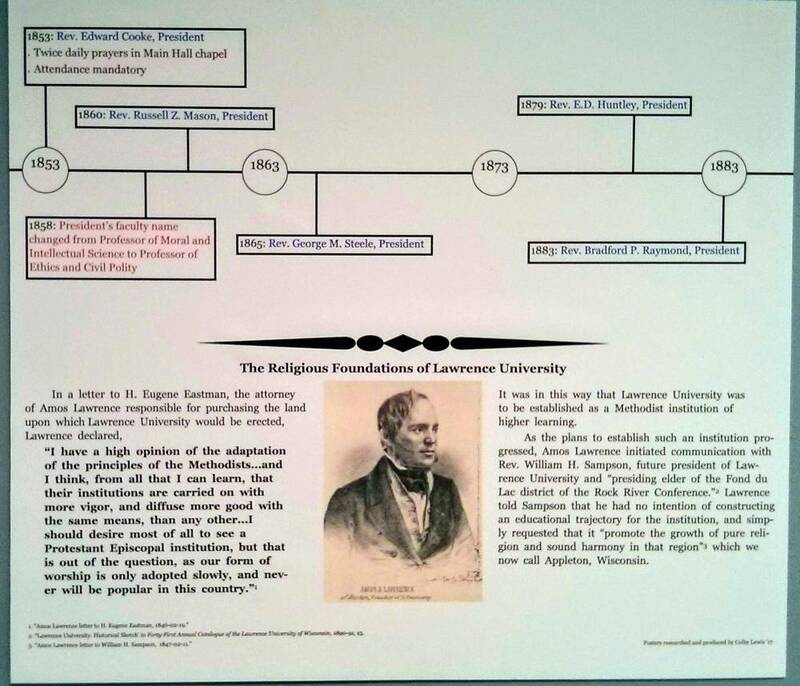 “Thirteen out of the first 35 students who attended Lawrence were Oneida.” This statistic is incorrect – it’s based on a misinterpretation of early student records here in the Archives. In reality, about 30 Oneida students attended Lawrence between about 1850 and 1880. Lawrence received both charitable support and dedicated federal funding (from the Bureau of Indian Affairs) to enroll these students. The goal, as we would understand it today, was assimilation. To learn more about some of these students, we might find tidbits in records like student newspapers. But beyond that, our records cannot show us what it was like to be an Oneida student at Lawrence in its early decades. It’s worth emphasizing that the presence of Native American students (and African American students) at Lawrence in these years is not evidence of an early institutional commitment to diversity and inclusion. We should aim to understand this history in its full context. If you are interested in learning more about this or other aspects of Lawrence history, please contact or visit the Archives. If you are interested in sharing reflections, please consider submitting a response to this form. Responses will be added to the Class of 2016 collection in the LU Archives and made accessible to all users who adhere to policies and procedures of the Seeley G. Mudd Library and LU Archives. For this project, anonymous responses will be accepted. Three years ago, we debuted an online collection of digitized issues of The Lawrentian available through our institutional repository. 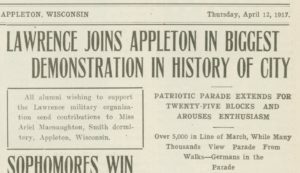 The collection contained issues dating from 1923 to 1992, digitized from microfilm at the Wisconsin Historical Society. Since this time we have added issues dating from 2006 to the present. But until recently we had a gap in coverage from 1992 to 2006. This gap has now been filled, thanks to a generous gift from Mary Jo Powell ’75. Digitization of this set of material was again completed by the Wisconsin Historical Society. This has been consistently the most-used collection in the repository, extremely useful for research on Lawrence history. 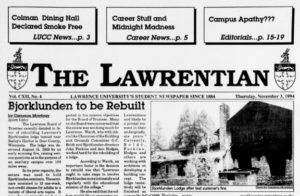 Here in the Archives, we use The Lawrentian online on a daily basis to answer questions about student life, traditions, athletics, special events and visitors on campus, changes in the campus or the curriculum through the years, and so on. We are very pleased to have a more complete set of issues available for use, and we are grateful to WHS for their work and to Mary Jo Powell ’75 for her support of the project!